FCI-CLASSIFICATION F.C.I. : Group 9 Companion and Toy Dogs. CRANIAL REGION : Skull : Well rounded apple head (a characteristic of the breed) . Muzzle : Short, straight seen from side, broad at set-on, tapering towards the tip. Lips : Lean and close fitting. Cheeks : Only slightly developed, very clean. Jaws/Teeth : Scissor or pincer bite. Overshot, undershot, as well as any other anomaly in position of upper or lower jaw must be strictly penalized. 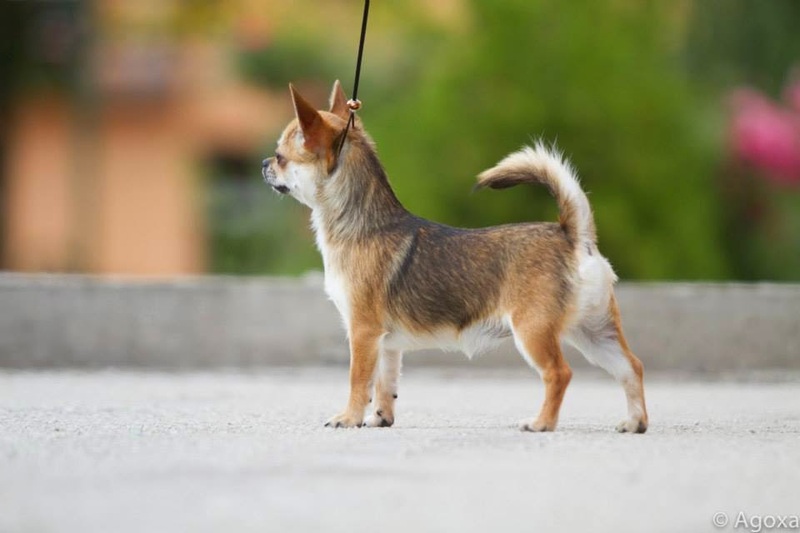 TAIL: The tail set and carriage are very important to the overall balance and outline of the Chihuahua, as it goes around the ring. Low set tails give the impression of the dog being too long in the back. Usually it is a consequence of the wrong inclination of the croup and rear angles. Tails slightly curled to one side, or curled down over the back, do not distract so much from the outline, but tails lying along the back like for example a Pomeranian or curled piggy-tail like, either on top of or to the side of the back, certainly distract from the dogs outline. The tail type is unique to the Chihuahua. It should feel quite broad and fattish with a positive broader area in the centre. Short tails looks wrong, especially on a Smooth Coat. Metacarpus ( Pastern) : Slightly sloping, strong and flexible. FOREQUARTERS: A Chihuahua does not have a terrier-like front, there is more play at the elbows than in a terrier front. The pasterns are finer and ankles much more obvious than in a terrier. The shoulders should be well up and sloping into a level back. Chihuahua has a good weight of bone, not too fine or too heavy. Hind feet : Very small and oval with toes well apart but not splayed (neither hare- nor cat-foot). Nails particularly well arched and moderately long. Pads well developed and very elastic . Dewclaws are not desirable. HINDQUARTERS: Strong driving rear action. FEET: Viewed from the front the pasterns should be straight but it is common to find Chihuahuas weak in the pasterns and turn out to a ten to two stance. . Dewclaws are not desirable (this sentence has to be removed). GAIT/MOVEMENT: Topline should remain firm and level when moving. Coming and going you should see only two legs . COAT: When looking at a Long Coat Chihuahua you should, in your mind’s eye, be viewing it without its coat and asking yourself if it would really look like a good representative of the breed. In Long coat you can find some with undercoat and a harsh outer coat, like to Pomeranian coat, which is a bad fault. In Smooth Coat there are two types of coat and both are equally correct. You can find very soft textured close glossy coat and this rarely has an undercoat or ruff. The other type of coat is slightly longer and has an undercoat and displays obvious ruffs. Blues often have problems with the hair on their ears when casting. SIZE AND WEIGHT : In this breed only the weight is taken into consideration, not the height. Weight : Ideal weight : between 1.5 and 3 kgs. Weight between 500 gr. and 1.5 kgs tolerated. Subjects weighing less than 500 gr and more than 3 kg shall be disqualified. Ideal weight: Between 1.8 and 3 kgs. Weight between 1 and 1.5 kgs tolerated. Subjects weighing less than 1 Kg and more than 3 kg shall be disqualified. Dogs with a fontanel bigger than 0,2 inches. In the long- haired variety : Dogs with very long, fine and billowing coat. Pomeranian coat. Subjects weighing less than 1 kg and more than 3 kg.